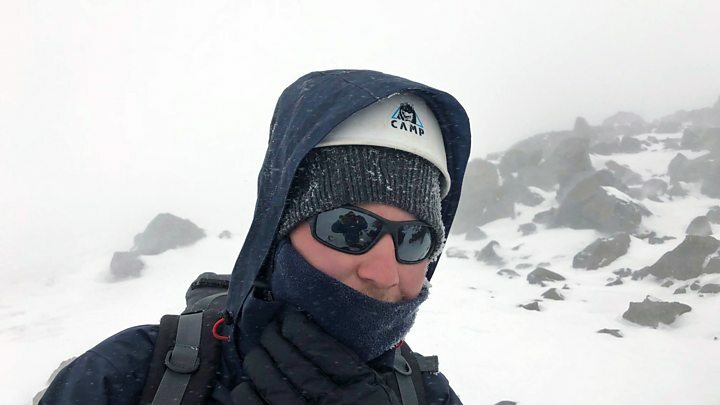 A 23-year-old is thought to have become the first blind British man to reach the summit of Europe’s highest mountain. Jack Garner faced winds of more than 50mph, -37C wind chill and a longer stay than usual on Mount Elbrus due to extreme weather conditions. In 2007, at the age of 11, Jack, from Scunthorpe, lost his sight over the course of a few months due to a genetic condition. It was “traumatic”, he says, but he was a sporty boy and challenges helped him cope, so he set his sights on Elbrus – all 5,642m of it. Jack got involved seriously in mountaineering in 2015. He climbed Mount Kilimanjaro over a six-day trip. Then in 2016 he took part in an 11-day Everest base camp trek. Eventually, in 2018, he decided to take on Mount Elbrus. “My parents were concerned when I told them what I was going to do,” he said. Elbrus is known to be a particularly technical and challenging climb, but Jack has always been a thrill seeker – completing sky dives and bungee jumps to raise money for charity – so he was undaunted. He reached the summit with four other climbers and two guides from the company Adventure Peaks. In total, he spent eight exhausting days on the mountain. “It was my first time walking on snow and ice. It took a bit of getting used to,” he said. He learned the basics from guide Paul Etheridge – how to use crampons as well as an ice axe. He needed to follow Paul very closely up the mountain and they found a method which worked for them. Paul held the rope taut at all times so Jack knew there was always the same distance of two metres between them. “Paul coiled the rope around his hand,” Jack said. Jack said when they got to a high altitude he found it difficult to communicate with Paul. Even though they were walking a lot slower, he felt his heart rate increase and, as a result, he was more breathless. Stu Peacock, from Adventure Peaks, told the BBC: “We think he is the first blind British person to successfully reach the summit. “It’s a fantastic achievement, in challenging conditions, at this colder time of year. Straddling the Russia-Georgia border and bulging above the Caucasus Ridge, Elbrus is a daunting prospect. It is nearly 1,000m higher than any of the peaks around it, and glaciers chew at its edges. There is a chairlift to 3,800m, where most climbs begin. However, Jack started his climb at 2,000m. A short distance above the chairlift is Camp 11; from here it is usually an eight-hour push to the summit. Jack completed the climb in less than six hours. Paul describes him as an “understated young man who doesn’t give himself enough credit”. Paul said he had contacted Guinness World Records who confirmed there was currently no record of a blind British climber ascending Elbrus, so Jack looks to be the first. He and his group were the first summiteers that day, beating Russian and Korean teams. “Jack and I summited at 10:05,” said Paul, “before any other parties on the mountain. “This was an amazing feat by any person, but Jack is fully blind.